A 6-year-old girl with recurrent episodes of hypertonic dehydration was studied. She denied thirst even with a plasma osmolality as high as 421 mosmol/kg. The hypernatremia was associated with an ability to concentrate urine (854 mosmol/kg). 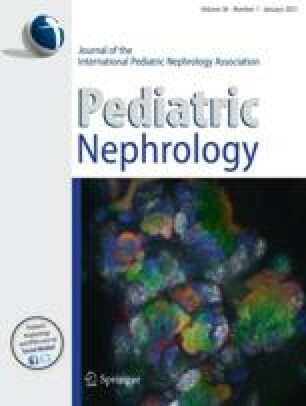 Volume expansion with water corrected hypernatremia (162 to 148 mEq/l) and resulted in an increased urine flow and urinary dilution (137 mosmol/kg) because of suppression of endogenousvasopressin (AVP) release (5.1 pg/ml). Hypertonic saline infusion raised the plasma AVP level (25.6 pg/ml) in response to changes in plasma osmolality (305 to 330 mosmol/kg) and led to a maximal urine osmolality of 818 mosmol/kg. With chronic forced fluid intake, the patient maintained a normal resum sodium concentration (range, 135–145 mEq/l) with a urine osmolality as low as 65 mosmol/kg. These findings are consistent with an isolated defect in the osmoregulation of thirst as the cause of the chronic hypertonic dehydration without deficiency in AVP secretion.